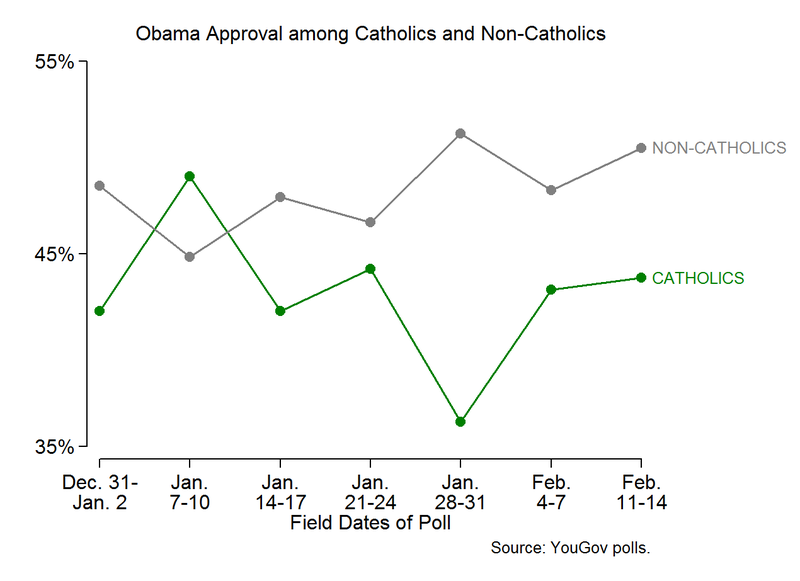 John Sides presents the chart at right to help us evaluate whether the contraception decision hurt Obama among Catholics. Jan. 28-29 apparently was when dioceses were told to talk about Obama's decision during worship services (and Jan. 29 was a Sunday). 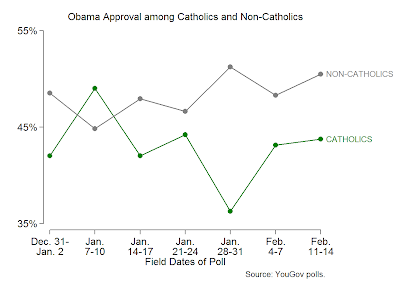 He notes that a good jobs report came out Feb. 3, but discounts this explanation of why Obama's numbers among Catholics moved back up, saying "There is no apparent reason why Catholics would react to the jobs report differently than others." It seemed to me that the jobs report provides a perfectly good explanation. Instead of continuing to be unhappy about the contraception thing like the Church hierarchy wants you to, a good jobs report gives you something else to think about. The impact of events fades with time, and especially with the occurrence of new events. I think you make a good point and based on the chart, it does seem very plausible that the positive job report is responsible for the Catholic numbers going up. But part of the point still remains. If this shows to have been such a great influence on the Catholic population, then why weren't the non-Catholics at least similarly affected? Surely, not only Catholics like jobs. It would be good to have a few more months' worth of data to help differentiate between statistical noise and real movement. But apparently the only way to get that would be to open a PDF for each additional week's polling, and hunt down that one question in each week's poll. I can see why Sides only gave us as much as he did, because with a busy day on tap, I don't have that time either.